Supplied image courtesy of positiveleoencounters.com. 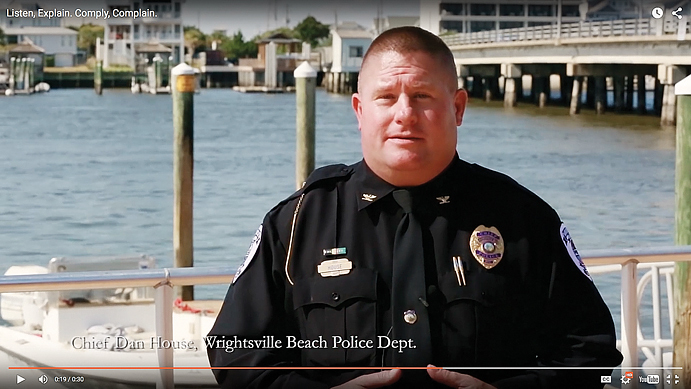 Wrightsville Beach Police Chief Dan House is one of the local law enforcement department heads featured in a new ad campaign, “Listen-Explain, Comply-Complain,” that aims to help prevent a violent confrontation between law enforcement officers and drivers and passengers during traffic stops. In a first for the town, Wrightsville Beach Police Chief Dan House was elected to be president of the statewide police chiefs association, a position he said will help keep the department connected with resources across the state. House assumes the head position at the North Carolina Association of Chiefs of Police after serving six years on the association’s board. He will attend four quarterly meetings during his year-long appoint to the position. The position will help the department continue to work on developing and achieving professional standards. House said he isn’t aware of a chief from Wrightsville Beach ever leading the association. Under his leadership, House said he wanted the association to focus on three main goals. One was to mentor newer police chiefs and build leadership within the association. Another was to strengthen partnerships with federal and state agencies. Improving resources related to mental health, including working with threats to schools and other public safety programs, would be another major focus of his tenure, House said. Organizations and partnerships are key to more effective policing, House said, noting that he regularly meets with other police chiefs in New Hanover County. Being active in the association also provides access to state and national resources, including an opportunity for House to be a member of the N.C. Governor’s Crime Commission. House said the benefits of his involvement in the organization were shown during Hurricane Florence, when departments from around the state offered to send support officers when staff resources were strained.